1. As all the guidebooks will tell you, there are over 250 bird species in Trinidad and Tobago, thanks to diverse habitats and proximity to South America. A birders’ favourite is the Asa Wright Nature Centre in Trinidad’s Northern Range, a former cocoa estate, home to avifauna ranging from jewel-like hummingbirds to cave-dwelling oilbirds. You can see dozens of species without ever leaving the estate house verandah. 2. 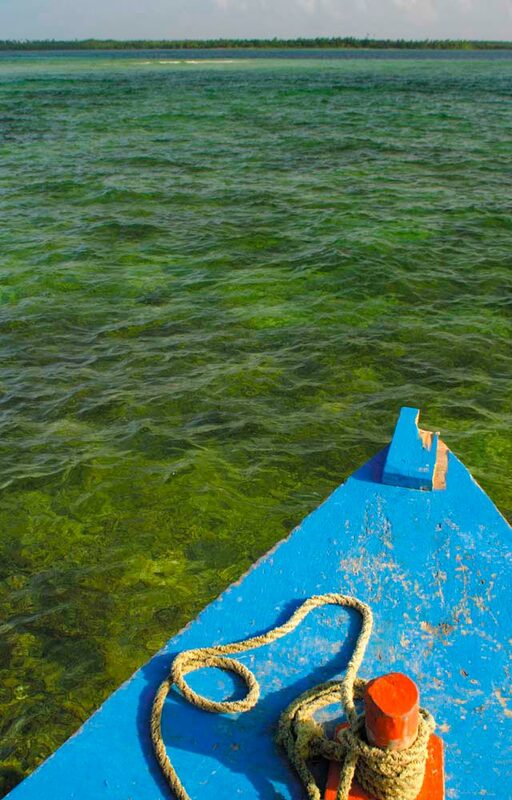 The Nylon Pool set in Tobago’s Buccoo Reef got its name from its utterly clear, calm water. This sandy, shallow stretch in the middle of the coral is like a natural swimming pool half a mile out at sea. It’s an obligatory stop on the glass-bottomed boat tours that leave from Pigeon Point. 3. 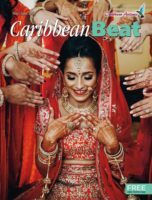 About a third of Trinidad’s population is Hindu, descended from East Indian immigrants in the nineteenth and early twentieth centuries, and major Hindu festivals are celebrated year-round. Phagwah — called Holi elsewhere in the world — is a joyous spring festival. Celebrants sing, dance, and throw vividly coloured dyes and powders over each other. Join in, and by the end of the afternoon you’ll be the same deep purple shade as everyone else. 4. During the annual nesting season from March to June, endangered leatherback turtles emerge at night onto the beaches of both islands’ north and east coasts to dig deep holes and lay their eggs, in a cycle unchanged since prehistoric times. Many beaches are patrolled by volunteers to prevent hunting. Tour operators can arrange permits and transport for visitors who want to witness the inspiring event. 5. Tobago’s Main Ridge is the oldest protected forest in the Western Hemisphere — and amazing terrain for mountain biking. Challenging climbs alternate with breezy downhill coasts along the criss-crossing forest trails, with amazing views of the sea. 6. The National Museum and Art Gallery in Port of Spain contains everything from Carnival artifacts to geological specimens to the bones of a giant sloth. The highlight may be the small Cazabon Gallery, home to the delicate topographical paintings of Trinidad’s best-known nineteenth-century painter. 7. 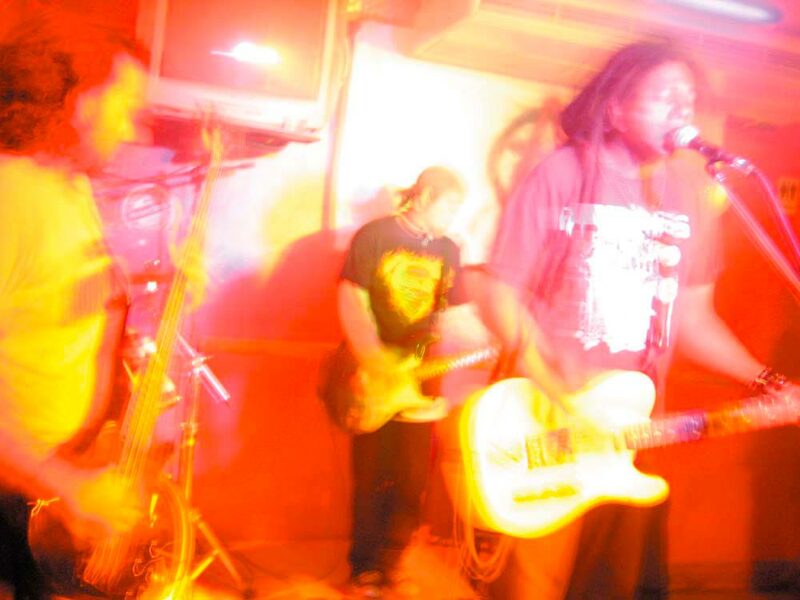 Trinidad is world-famous for its calypso and soca, but there’s also a thriving underground music scene centred on small bars and pubs. 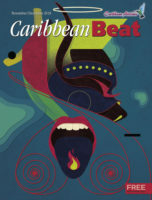 Bands like jointpop, Orange Sky, and 12 blend the rhythms of rock and roll with calypso and reggae, creating a unique sound. 8. 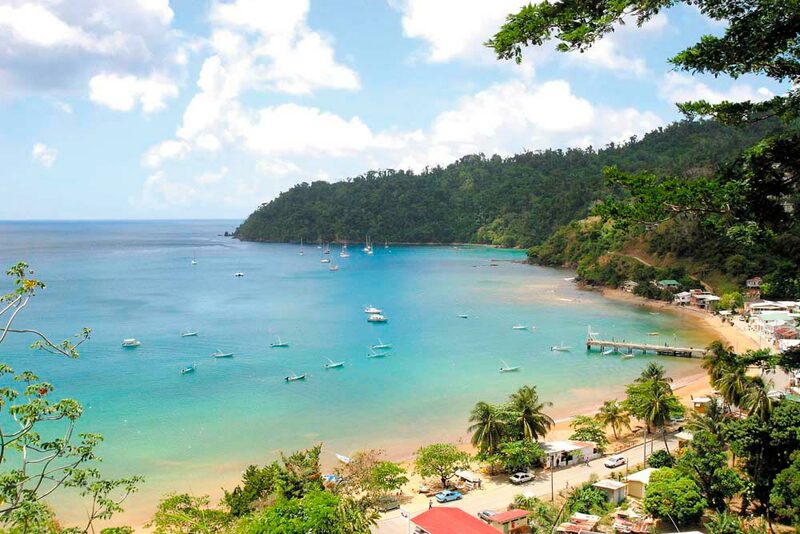 Some say Daniel Defoe had Tobago in mind when he wrote about Robinson Crusoe’s shipwreck, and for centuries Tobago’s been nicknamed “Crusoe’s Island”. Some locals will even point you to Crusoe’s cave, set in a cliff near Crown Point Airport. Believe the story or not, it gives you a good excuse to explore the coast around the island’s south-west tip and perhaps take a swim at a secluded beach. 9. El Tucuche, Trinidad’s second-highest peak, towers 3,073 feet above the north coast. It’s a strenuous four-hour hike to the summit, but along the way you may spot rare species like the elusive golden tree frog, and the real payoff is the incredible 360-degree view, with the whole island spread out below. 10. 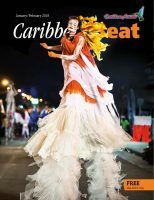 Carnival is the event that many visitors come to Trinidad for — weeks of music and partying coming to a grand climax on Carnival Monday and Tuesday and the parade of the bands through the streets of Port of Spain. For many locals, the highlight of Carnival, the element of the festival with the deepest roots, is J’Ouvert (French creole for “day open”). 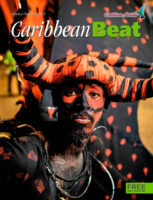 In the dark pre-dawn hours on Carnival Monday morning, revellers cover themselves with mud, paint, grease, and dance through the city in a primal ritual to welcome the Merry Monarch. 11. The small graveyard in Plymouth, a village on Tobago’s north coast, is home to one of the island’s most curious monuments: the so-called Mystery Tombstone. The remains of Betty Stiven and her child lie beneath this famous inscription: She was a Mother without knowing it and a Wife without letting her Husband know it except by her kind indulgences to him. Locals have several interpretations of this riddle. What’s yours? 12. North-east of Port of Spain, beyond the St Ann’s hills, is the Santa Cruz valley, once home to cocoa estates, now largely residential, but still tranquil and green, with many acres of forest and open pasture. It’s a lovely setting for horseback riding, and one of the horse farms or riding schools in the valley can provide you with a fine mount and all the equipment you need for a canter along a cool stream or through a bamboo grove. 14.Tobagonians will tell you it’s the biggest single brain coral in the world. Is it? Check the record books if you like, or just trust your eyes. At Angel Reef just off Speyside near Tobago’s north-western tip, you can snorkel, dive, or ride a glass-bottomed boat to see the famous specimen, twelve feet high and sixteen feet high. 15. Tucker Valley bisects Trinidad’s north-west Chaguaramas peninsula. At the valley’s northern end is Macqueripe Bay, open to the Caribbean Sea but sheltered by the hills of the Northern Range rising steeply from the water. Much smaller and less famous than Maracas, Macqueripe is a quick drive from Port of Spain, crowded on weekends but somehow never too crowded. Dolphins sport among the waves near the mouth of the bay, and the half-ruined jetty on the eastern side makes a perfect diving platform. 16. At first glance, it may look like a huge parking lot: ten acres of black pitch, dotted with shrubs and small pools of water. But Trinidad’s Pitch Lake is far more interesting on a closer look. One of only three natural asphalt lakes in the world, it was used by Walter Raleigh to caulk his ships in 1595, and in the 1860s commercial mining began. Roads all over the world are paved with Trinidad lake asphalt. Wonderfully, as fast as pitch is extracted, more oozes up from the centre of the lake. The sulphuric water that collects on the surface is reputed to be excellent for the skin. 17. How long must you live in Tobago before you’re considered a Tobagonian? German artist Luise Kimme has been here since 1979, long enough to become an honorary local. Her eccentric hillside house near Mt Irvine is full of her energetic, colourful, larger-than-life-size wood sculptures of dancers and local folklore. 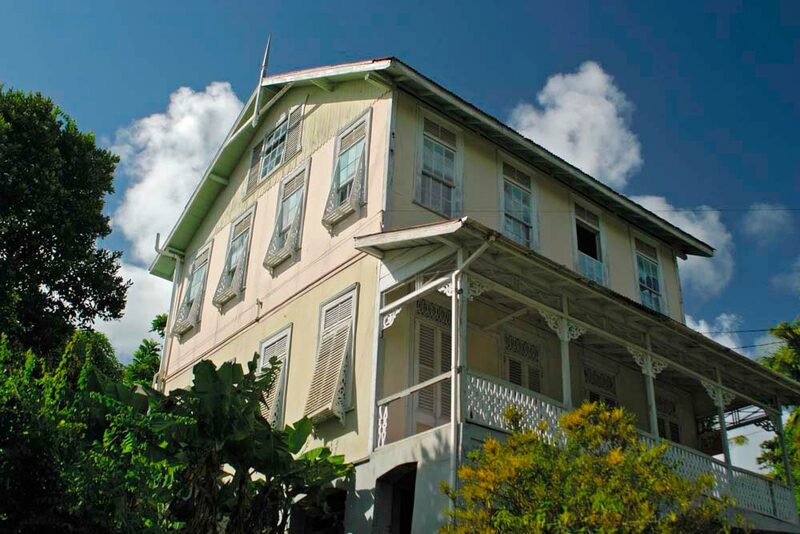 The Kimme Museum is an obligatory stop for art lovers in Tobago. 18. 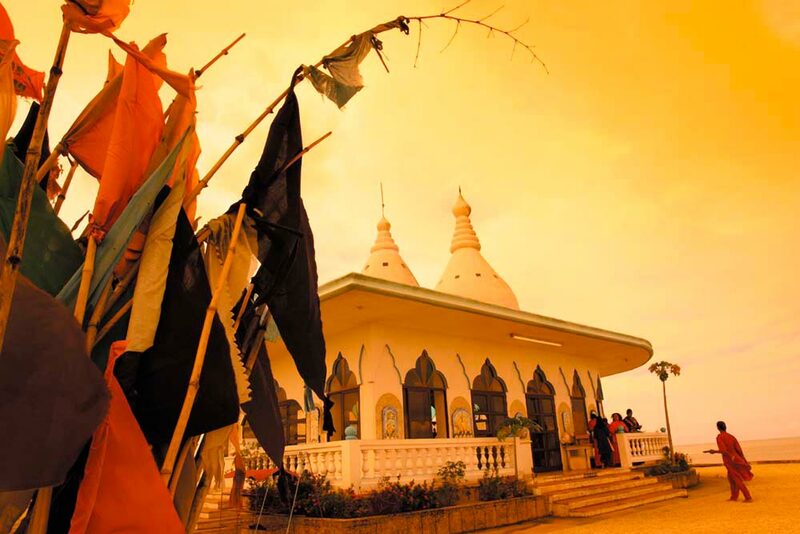 Waterloo on Trinidad’s west coast is home to one of the island’s most remarkable structures: the Temple in the Sea, a Hindu temple built on a tiny artificial island in the Gulf of Paria, connected to the shore by a causeway. When Siewdass Saddhu, a devout Hindu working on the Waterloo sugar estate in the late 1940s, was denied permission to build a place of worship on estate land, he built the temple and its island singlehanded. It has become a place of pilgrimage, and the nearby beach is lined with prayer flags. 19. 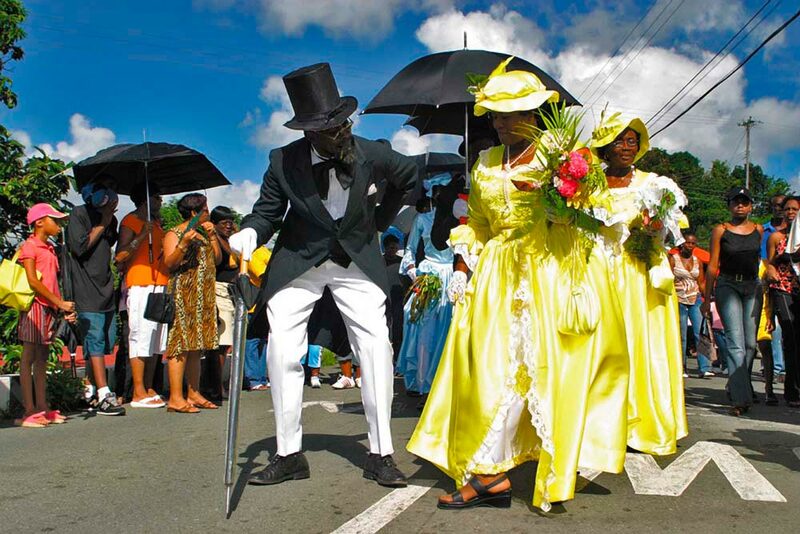 At a traditional Tobago wedding, like the one reenacted every year in Moriah for the Tobago Heritage Festival, the women guests wear long lace or taffeta dresses, gloves, and hats trailing ribbons; the men are decked out in scissor-tailed coats and top hats; the wedding procession dances from the church to the reception to the music of fiddles and tambrin; and the bride’s godfather gives a hilarious speech full of impressive made-up words. Then comes the wedding feast . . .
20. The dry season is at its breezy height in April; this is also kite season, when on Sunday afternoons the skies above parks and other open spaces are filled with kites of all shapes and sizes, from traditional varieties like chickeechongs and mad bulls, made from crêpe paper and bamboo cane, to colourful plastic models imported from China. The Savannah in Port of Spain is a good place to start. Fly a kite or just look on, enjoying a snow cone from a shady bench under a flowering poui tree. 21. 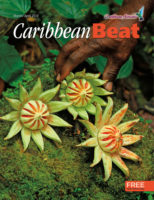 Trinidad’s earliest inhabitants were Amerindians migrating from South America up the Antillean chain. 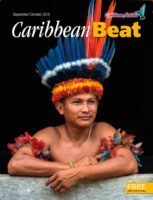 Over the centuries, colonisation, conversion, and assimilation have taken their toll on these peoples, but many Trinidadians have Amerindian blood (even if they don’t know it), and the Carib Santa Rosa Community in Arima are the guardians of the island’s indigenous heritage. During the Santa Rosa Festival at the end of August, the community celebrates with a smoke ceremony, a procession, and a religious service. 22. In some parts of the world, Easter is celebrated with chocolate eggs. In Tobago, people go racing — goat racing. Every Easter Monday in the village of Buccoo, the island’s fastest goats, beautifully groomed, assemble with their “jockeys”, who run beside them instead of riding on them. A somewhat more leisurely sport is traditional crab racing, in which the competitors — scuttling sideways — must be gently prodded towards the finish line. 23. Hosay is the Trinidadian name for the Shi’ite Muslim festival known elsewhere as the Fifth of Muhurram, commemorating the martyrdom of the grandsons of the Prophet. Over a period of weeks, elaborate floats representing the tombs of Hussain and Hassan are built in special yards before being carried through the streets on the final night to the sound of drums. The largest Hosay display is in the west Port of Spain district of St James. 24. The Caroni Bird Sanctuary protects sixty square kilometres of mangrove swamp and tidal marshes on Trinidad’s west coast, south of Port of Spain — as well as the more than 150 bird species that live here, including, most spectacularly, the scarlet ibis, the national bird. With its bright red plumage and elegant long bill, a single ibis is a striking sight, especially glimpsed in its native habitat, in the branches of a mangrove. But imagine hundreds of them swooping in at dusk to roost together for the night, turning whole trees bright red. On the boat ride from the sanctuary headquarters, look out for many more bird species, plus caimans, snakes, raccoons, and opossums. 25. 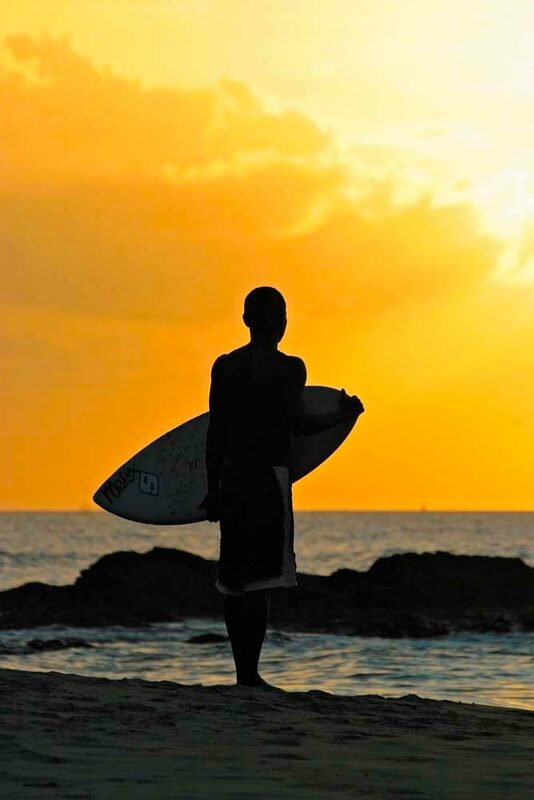 There are many ways to end a great day in these islands, but here’s a particularly good one: watch the sunset over Pigeon Point, Tobago’s most famous beach. As the sky flushes pink and all the little clouds turn to gold, the coconut trees seem to lean into the light and the gentle lapping of waves lulls you into a special kind of calm. If you’re very lucky, at the moment the sun dips below the horizon you may see the elusive emerald flash. Even if you don’t, you’re still very lucky. You’re here, after all. 26 Swim in the lagoon at Grande Rivière, where the cool river water slides into the warm sea. 27 Learn a few words of French creole patois in Paramin, a picturesque mountaintop village just a few minutes north of Port of Spain. 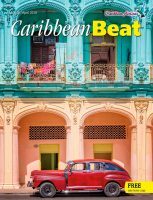 28 Wander around the narrow, steep streets of Scarborough, Tobago’s capital, where ramshackle gingerbread houses jostle against little shops and restaurants, with gorgeous views round every corner. 29 Join the spectators at a village cricket match at one of the tidy little grounds scattered across both islands. Better yet, grab a bat and try for some runs yourself. 30 Little Tobago Island, off Tobago’s north-east tip, used to be home to a colony of birds-of-paradise imported from Papua New Guinea. They died out years ago, but the island is still a sanctuary for dozens of bird species, including the spectacular red-billed tropicbird. 31 The Pax Guesthouse on the grounds of the monastery at Mount St Benedict is famous for its afternoon tea — featuring honey from the monks’ own apiary — and the extraordinary 180-degree views across Trinidad’s central plain. 32 Explore the mud volcanoes of south Trinidad. Devil’s Woodyard near Princes Town is the most accessible. 33 Not far from Roxborough on Tobago’s south-east coast, Argyll Falls are the highest on the island, a refreshing fifteen-minute walk from the road. 34 Try to count the coconut trees — tens of thousands — growing along Manzanilla Bay on Trinidad’s east coast, twisted by the Atlantic winds. 35 Join a heated discussion in Woodford Square, downtown Port of Spain’s own speaker’s corner. A blackboard in the south-east corner lists the day’s topics — anything from political scandals to international events. 36 Take to the seas during Tobago Sail Week, sponsored by Angostura — seven days of sailing events off Store Bay and parties onshore. 37 Trinidad and Tobago was the first country in the world to declare a holiday for Emancipation Day, the anniversary of the end of slavery. In recent years, Emancipation has grown into a weeks-long celebration of the country’s African heritage. 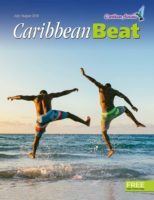 38 Chill out in Charlotteville, a secluded fishing village near Tobago’s north-eastern tip clinging to the slopes below Flagstaff Hill. 39 Admire recently restored Lion House in Chaguanas, the bustling “capital” of central Trinidad. Built by the celebrated Capildeo family on the model of an Indian townhouse, it was the birthplace of V.S. Naipaul, who immortalised it as “Hanuman House” in A House for Mr Biswas. 40 Stare across the Serpent’s Mouth at the distant silhouette of Soldado Rock, halfway to Venezuela, from Icacos, at the furthest tip of Trinidad’s south-western peninsula.